So far in this intro course we haven’t discussed authentication although we enabled it when we created the demo Web Api app. 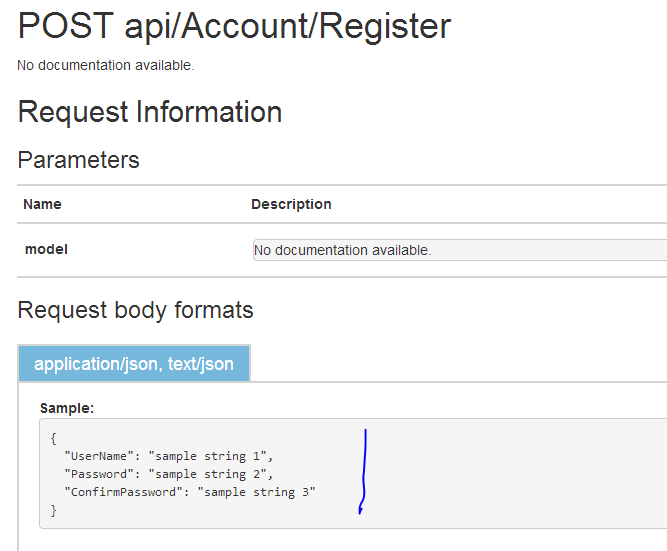 In this demo we’ll see how to make an authenticated request to the API. 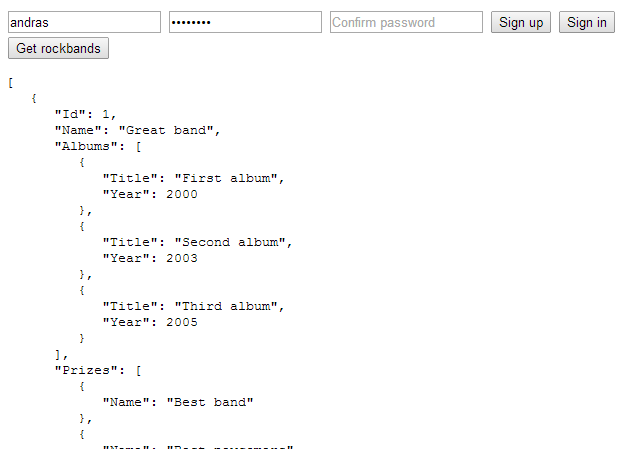 Let’s imagine that our rockband data is top secret. Therefore not just anyone should gain access to it. Open the demo app and the simple HTML web app we’ve been working on and let’s get started. Recall from the previous post in this series that we made an anonymous call to the API via the Get Rockbands button from the HTML web app. We’ll see how the need of authentication changes the picture. Note the “name” attributes of the input tags. They correspond to the properties in the JSON that the Register action expects. The case doesn’t matter: userName, USERNAME, etc. will all do the job. Not surprisingly we get a validation exception. So we’re registered but we still cannot access the rockband data. We’ll need to send along an access token. In fact we need to send it along with every request that requires authentication. It’s not the same as a cookie in the case of forms authentication. Instead, we’ll need to send the token in the request header. This is done by logging in with the website using the login credentials and get hold of the access token from the website. If you look at the Help page again in the API app you won’t find any logical candidate for this task. There’s no “login” or “gettoken” endpoint. This means that we need to specify a grant type which is missing, hence the “unsupported grant type” error message. The endpoint is expecting some data called “grant_type=[type of grant]”. Let’s see how we can build that. Our form will also function as a login form. Not a very practical solution but it will do for demo purposes. We’re calling the /Token endpoint and send along a grant type of password. This is telling the endpoint that we need an access token based on the username and password in the form data. We save the access_token property from the JSON that came back from the web api auth request. This is slightly more complicated than it should be but it may change in the future. There’s actually a readily available single-page version of we’ve just done among the MVC 5 templates. The signup function uses the Account controller and a POST to the /Token endpoint like we did above. Thank’s for your great posts! Hi Bartosz, you’re right, thanks, corrected it. Great post but currently access_token is only saved in var. If I reload the page, the access_token is gone. This access_token must be saved as cookie or something but how you can access it from HTML? Great post but currently access_token is saved in var. If I reload the page, it is gone. How to get the access_token from the HTML again? I assume it is must be stored as cookie. Thanks. You can also call a server side function with ajax and save it in the database or a session variable. What do you mean exactly? Like how to allow running GET vs. POST requests? I want to build authentication. I used AuthorizeationFilterAttribute. But, I don’t know how client call this. This is my first time build web API. So, I don’t know I am doing correct or not. All demo projects can be downloaded from GitHub. Check out the menu item called Github for the necessary links. Hi Andras Thank you for sharing your demos they are very useful. I just want to ask you one little question . I want to write a WebApi using security with token but my users is not person my users will be servers because i’m thinking to link my WebApi in my project so do you have any idea for this situation how can i store my server register user and my data is it in same database or two different database (one of is local for register and one of is my data?) Could you give me a suggession please? You can create a special user dedicated for the server calls and log in as that user maybe? Thanks much, I think you have part of what I want to do here but maybe not all, else I misunderstood. I have a web api project and I have a SPA project (separate projects in the same solution). I want the SPA project to authenticate with the web api project. Is this what you are doing before you started mentioning SPA? Isn’t The SPA template you mention toward the end trying to use its own identify infrastructure. How do I get it to use the web api project to authenticate (and all the other functionality)? Markus, no, I didn’t use the SPA template for the auth demo. I only mentioned it to make people aware of it. I simply used a HTML page with JS on it, nothing fancy. Hi Andras. Thanks a lot for this post. 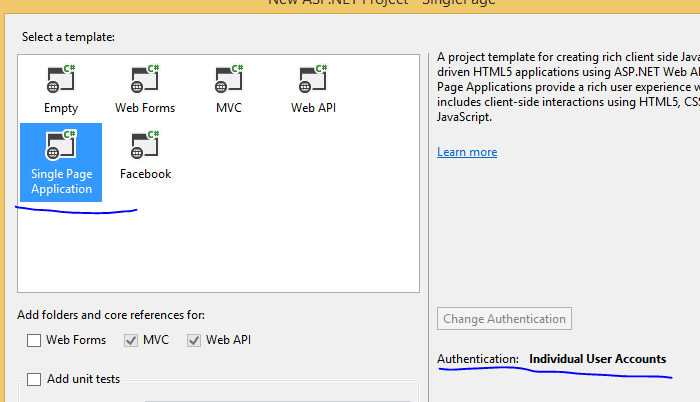 What changes need be done in your project to use web API identity authentication based on user information stored in SQL database? The user is stored in a local SQL database, so you’ll probably only need to specify another connection string. Unless I’ve missed something in your question. I go through authorisation in MVC5 more here. That series shows the backend parts of authentication in an MVC/Web API project. Used your info, works well and appreciate your time. but still getting a 500 error when requesting the token? Check the sourcecode on GitHub here: GitHub repo. You may have missed some detail. You are Guru of Authentication. I read your SAML/Federation articles and WebAPI one.. it is amazing the insight and strong hold you have and the way you present details. You really help a lot with your articles. Great job and Thank you! A guru should be an internationally well-known expert of a subject, like Dominick Baier on .NET security and I have a lot to learn. One small update on this post: as of June 2015 api/account/register now seems to require an email field as well as the name and password fields. After getting the error message, I added it and all was well. Unfortunately, the /Token workaround for CORS in ApplicationOAuthProvider.cs no longer works as of June 2015. This may be because Microsoft has changed what the variable user instantiates in GrantResourceOwnerCredentials. I’ve tried several things but bottom line is I’m not knowledgeable enough to get CORS to work with the new object. Anybody have an idea of how to handle this change? what about of logout button ? Hi, nice post, very helpful too. In my scenario, I have a login page login.html, after get the token I want to go with index.html, obiously I need to bring the token. ¿How can i handle this?. then catch the header in client app. I don’t know which is the best practice to apply here ¿Could you give me an idea to handle this?. Great post! Very helpful, and excellent explanations. Thank you!